Why doesn’t the NRA organize an attack on Gullinbursti? Every now and then there is a confluence of news that creates a sense of disorientation. Yesterday was one of those days. To put this in perspective, I am still under the influence of The Great Aridness by William de Buys. As a result, when I glance out the window as I work, I have the feeling, as a friend said, that I am “looking at a world that is dying.” Things feel odd. But on to other sources of weirdness. The newspaper reported yesterday that the European Commission has decided to ban for two years a class of pesticides called neonicotinoids that may have something to do with the decline of bees internationally. The United States is just watching, although our domesticated bee populations are at a 50-year low and falling. Of course the companies that make the product are infuriated, claiming “a setback for technology, innovation and sustainability.” There are many reasons for colony collapse disorder, they say, not just their pesticide. Actually, I bet they are correct. The worker bees are simply disappearing, apparently unable to find their way back to the hive. And just think about everything they’re dealing with. They’re being driven thousands and thousands of miles to pollinate crops all over the country. Maybe the vibration of the trucks bothers them, the changes in environment, the specialization in certain crops, and the exposure to a wide variety of chemical fertilizers, pesticides, and pollution. Maybe stress has impaired their immune systems, leaving them vulnerable to a host of disorders, microbes, and mites. Maybe they’re tired. Maybe they don’t feel like real bees anymore. And if they are becoming physically impaired by the world in which they live, what about us? An earlier article pointed out that we in theUnited Statesare living with some 85,000 industrial chemicals. The EPA has mandated testing for only a small percentage and only five have been banned. As a result scientists say that many babies are being born pre-polluted, sometimes with hundreds of synthetic chemicals showing up in their blood. On the other hand, amid all the news about disappearing bees, declining public health, a deteriorating environment, wildlife extinctions, and harrowing signs of climate change, there is one species that is flourishing as never before—feral hogs. Their ancestors were brought here first by Christopher Columbus and then the Spanish explorers. They were domesticated into the familiar “Porky Pig,” but some escaped and went wild, becoming an invasive species. 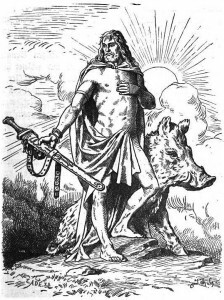 Then hunting ranches in the Midwest began to breed feral hogs with the Russian wild boar that can reach up to 600 pounds. When wounded or angry, the males will charge, slashing upward with their tusks to lacerate the thigh. Sounds like pretty sporting prey. The problem is with the escapees from farms and hunting ranches. There are now over six million creating havoc in some 47 states. They tear up fences, dig up crops, kill small livestock, and will eat almost anything they come across. The females have litters of up to 10 twice a year. The math is kind of exciting. 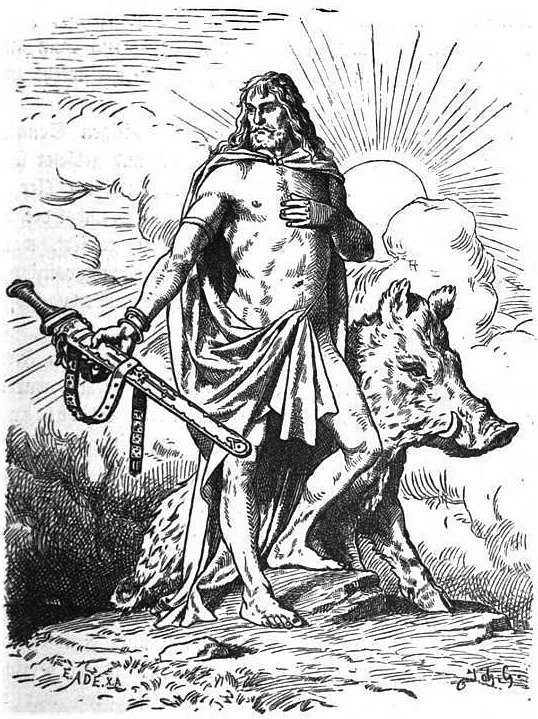 In Norse mythology, there was a boar named Gullinbursti. What a great name, and it suggests the amazing vigor of the species. They’re surely not bothered by our contaminated world, and it doesn’t seem to be harming their flesh. In fact, a restaurant in Austin called Foreign and Domestic is now serving feral pork in porchetta. These creatures seem worthy of our respect. Nevertheless an alarm is sounding and one wonders why it has come to this. Didn’t we just have a big battle in Congress in which hunters played a starring and successful role in defending their rights? Isn’t this a problem they could solve? Why doesn’t the NRA organize an attack on Gullinbursti and improve their image? The guys who aren’t very good shots could even use their semiautomatics. And they could learn how to clean and butcher properly, lay the meat up in the freezer for tough times or give it away to local food depots. Their popularity would surge. And let me be clear that I am not suggesting that the government play any role at all in this. It has better things to do. In fact there was another article in the paper yesterday about a new probe the FDA is undertaking. Apparently Wrigley has just introduced a caffeine-laced chewing gum called “Alert Energy Gum.” There is growing concern about the effect of caffeine on children’s health, so a new investigation will be launched. This could be serious in fact–the tipping point, you know. One oddity too many in our environment and suddenly our GPS system, like that of the bees, fails so we don’t know where we’re going. Maybe there are signs of that already.